Ratification was the process by which the 13 states studied, debated, sometimes temporarily rejected and all finally approved the newly drafted Constitution. The approval of nine states was needed to put the new government into operation, but as a practical matter the large states of Virginia and New York were crucial if the new scheme were to have any hope of success. From today’s vantage point, it seems easy to assume the approval of a new form of government. However, such was not necessarily the case during 1787 and 1788. The public appears to have been about evenly split at the beginning of the ratification debate, and such notable figures as Samuel Adams, Thomas Paine and Patrick Henry were vocal opponents. The contest in New York appeared to be dominated by the Anti-Federalist forces under George Clinton that were opposed to ratification of the Constitution. The pro-ratification forces, the Federalists, were led by Alexander Hamilton. In a masterful display of political skill, Hamilton overcame a two-to-one advantage by the Anti-Federalists. The final vote was 30-27 for approval in the New York convention. During the debate in New York, Hamilton joined with James Madison and John Jay in writing The Federalist, a series of essays that analyzed the Constitution and countered the arguments against it. The contest was also spirited in Virginia, where the anti-Federalist side was taken up by Patrick Henry and the Federalist side by James Madison, the Father of the Constitution. Ratification was achieved in Virginia only after it was decided to add a Bill of Rights to the Constitution. Perhaps nothing was more helpful to the Federalist cause than the support of the two most prominent Americans, Benjamin Franklin and George Washington. In December 1787, Delaware became the first state to ratify the document. On June 21, 1788, New Hampshire ratified the constitution, giving it the theoretically sufficient endorsement of nine states, but New York and Virginia had yet to agree. Without them, the federal government couldn't function. Four days later, Virginia signed on and after another month, so did New York. 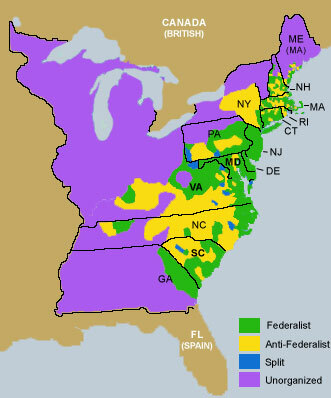 Two states, North Carolina and Rhode Island, rejected the Constitution, but later reversed their votes after the other states had given their approval. Their ratifications came after Washington's first inauguration. Rhode Island held out until 1790, when ratification passed 32 to 30. Quotes regarding Ratification: The U.S. Constitution is Born. The Debate on the Constitution : Federalist and Antifederalist Speeches, Articles, and Letters During the Struggle over Ratification : Part One, September 1787-February 1788 (Library of America) by Bernard Bailyn. Founding Rivals: Madison vs. Monroe, The Bill of Rights, and The Election that Saved a Nation by Chris DeRose. America's Second Revolution: How George Washington Defeated Patrick Henry and Saved the Nation by Harlow Giles Unger. Slavery's Constitution: From Revolution to Ratification by David Waldstreicher.